My closet is full of clothes, but somehow I'm tired of all of them! Now that I work from home, I've been wearing jeans and a casual top everyday. My dry clean only items sit untouched, and I keep a rolling rack of my favorite items in my bedroom, neglecting my two large walk-in closets stuffed with fancy favorites of seasons past. I knew that transitioning to being self-employed would involve a lot of change, but I didn't think about how it would affect my wardrobe! After years of dressing up for work and being in a corporate setting, I was seriously lacking everyday-wear that I could mix and match to make up a casual trendy wardrobe. I knew I needed to buy some versatile pieces that I could easily pair with my wardrobe staples as well as pack for my upcoming trip to Paris! 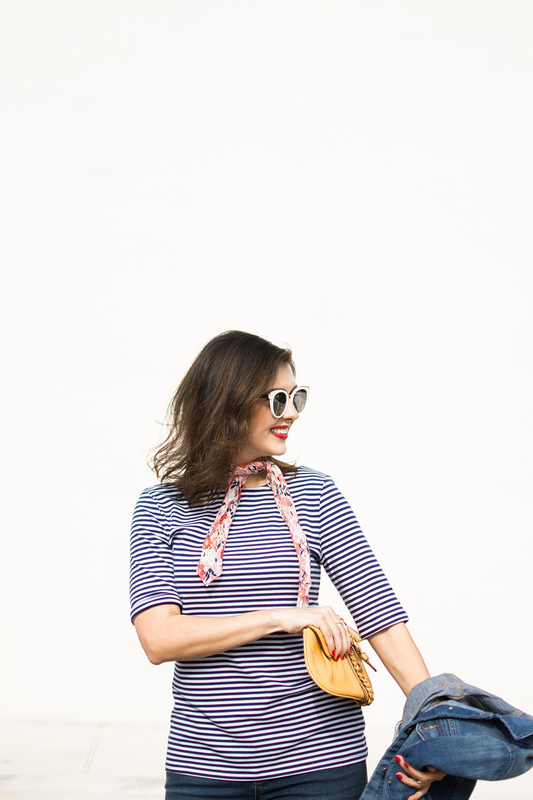 For my spring wardrobe, I'm focusing on neutrals and staples that I can dress up and down, as well a few pops of color and some eye-catching accessories, like this neckerchief from Old Navy. I wanted to start with a pair of jeans with one trendy detail- a frayed hem, which I love! I wanted something trendier than my usual skinny jeans, and didn't want to spend a designer price, so I was thrilled to find these frayed hem jeans as well as a pair of white distressed denim, which I have been wanting for years! I snagged a few striped tops (you can't have too many stripes!) and especially love this scoop back tee. I added this floral neckerchief to brighten things up and I think it looks Parisian, so of course I'm on board. A denim jacket is something that I have recommended to other women for years, but I didn't have one until now, and I love it! Gold sandals and white sunnies complete the look and keep my outfit fresh. Refreshing your accessories is a great way to update your look from season to season and I love these two items for spring! Now that I have a few new spring pieces, I'm feeling inspired to remake outfits and enjoy what I'm wearing each day! This post was produced in partnership with Old Navy.